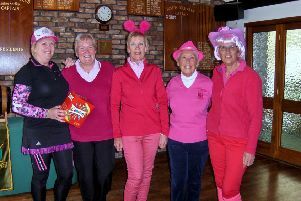 Twelve ladies took part in the Boston Golf Club Past Captain’s Trophy and Medal competition. The winner was Pam Hyde with 89-18 =71 nett, the overall winner and also winner of the lowest gross. She also saw her handicap drop to 16. The runner-up was Lady Captain Janet Read (103-26 =77 nett) and third position went to Vice-Captain Pam Clare (103-25 =78 nett). A two was recorded on the 14th hole by Jane Marriott. A Boston Golf Club team won the Lincolnshire Past Captains’ Team Shield. Teams from around the county took part at Laceby Manor Golf Club, and the winning team were Pam Hyde, Pam King, Ann Hodgson and Jean Markham.